Today’s disaster recovery plans have the possibility to store data in more places than ever before. Thanks to the proliferation of public cloud and cloud storage, most organizations are able to utilize public cloud storage as “offsite” storage for backup data. In fact, this is one of the primary use cases where organizations are leveraging public cloud storage in 2018 and proposed 2019 budgets. If businesses today are not leveraging public cloud storage as part of their disaster recovery plan, why should they be doing so? How is public cloud storage effectively used to augment current disaster recovery plans that organizations may already have in place? Let’s take a look at what the public cloud is exactly and the advantages of public cloud storage in disaster recovery plans to see why and how this is being done. Public cloud at its very basic definition is simply computing resources that are offered by third-party providers that is accessible via the internet. However, today’s public cloud is so much more than that. 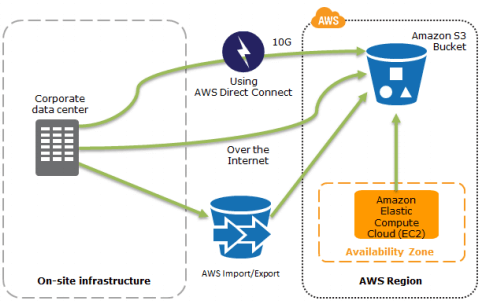 Offerings from the likes of Amazon AWS, Microsoft Azure, and Google Compute Cloud span a wealth of various services that are offered to customers including Infrastructure-as-a-Service (IaaS), Platform-as-a-Service (PaaS), Functions-as-a-Service (FaaS), Software-as-as-Service (SaaS), and many other offerings. Organizations often get their feet wet with the public cloud by shifting services such as email as well as storage to public cloud providers. Public cloud storage is relatively cheap and certainly provides a means to extend on-premises resources out to the cloud easily. This includes and helps to extend organizations abilities to bolster disaster recovery solutions to help achieve the 3-2-1 backup best practice methodology as we will see. 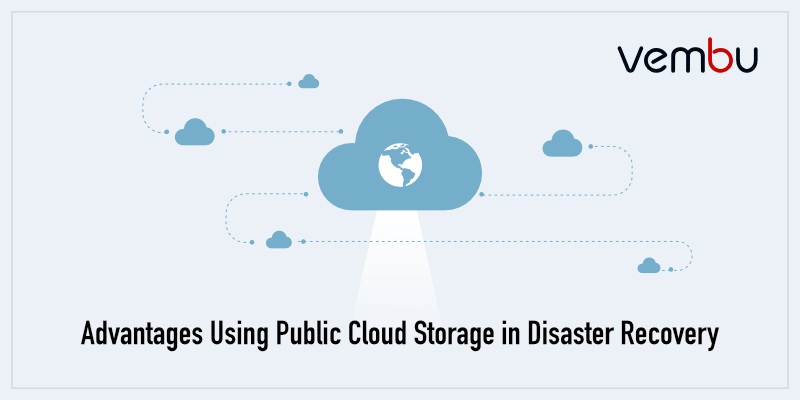 When thinking about strategies using public cloud storage in disaster recovery, there are many reasons why public cloud storage is a great fit for key aspects of any disaster recovery plan. Let’s take a look at the above reasons and see why public cloud helps to meet the above aspects of effective disaster recovery plans for today’s organizations. Backup best practice methodology follows the 3-2-1 backup best practice rule. This states that you should have at least (3) copies of your data, stored on (2) different kinds of media, with at least (1) of these stored offsite. When thinking about traditional disaster recovery plans, before public cloud existed, the (2) different kinds of media generally involved both disk-based backups and tape backups. This satisfies the (2) different forms of media. Generally, tapes are stored in an offsite location such as a DR facility, away from the main production site. Public cloud has opened up new and exciting ways to satisfy these backup best practice requirements. In a sense, a public cloud is a different form of media. Even though we know that cloud storage is stored on disks in the public cloud vendor’s data center, the entire infrastructure is separate and fundamentally different from the enterprise data center that may be powering a production site. Public cloud infrastructure is exponentially more redundant and resilient to any type of failure than most customer’s enterprise data center environments. From an “offsite” perspective, the public cloud allows extremely powerful options to satisfy the requirement to have data stored in a completely different location than the production site. This can even be different geolocation altogether. Most of today’s top public cloud vendors have datacenters all over the world and often have multiple data centers in various countries. This leads to a wide number of options when thinking about where data can and should be stored. Above all, you want to have data diversity. In other words, you never want to have all your “eggs in one basket”. This is the whole intent and purpose behind the 3-2-1 rule. You want multiple copies of your data, in different locations, and media types so that the chances of losing ALL data and backups, is extremely slim. Cloud certainly adds powerful options for organizations looking to diversify where and how their data is stored. Using data protection solutions that allow leveraging both the traditional means (tape) and public cloud means to store data, are extremely powerful. Public cloud storage is certainly a cost-effective means to store data. While per gigabyte, compared to on-premises storage, cloud storage is more expensive, there is added value to consider. While cloud storage may be more expensive on the frontend, there are value-added services that come with cloud storage that should be considered. Cloud storage provides agility that simply can’t be achieved with on-premises storage provisioning. Cloud storage is almost infinitely scalable and can grow to fit the needs of customers with the click of a button and without any additional provisioning of infrastructure. This includes the time to purchase, rack and stack new equipment, provision the equipment/storage, and begin consuming it. With the cloud, this is instant. The cost of cloud storage is certainly attractive as well in hybrid scenarios. This is especially the sweet spot for BC/DR use cases where customers have on-premises storage, but want to augment the on-premises storage with cloud storage for archiving and off-site DR.
We have already touched on this, but cloud storage is virtually infinite. Customers can essentially have as much storage accessible as they need or want. This storage can be located virtually anywhere on earth and easily provisioning or mounted anywhere there is connectivity. This would be extremely difficult, if not impossible, for organizations to pull off with only on-premises equipment. Public cloud storage provides the means to have the virtual storage abstracted from the actual physical hardware serving out the storage. This effectively removes any limitations in scale or compatibility that enterprise customers may encounter provisioning their own datacenter storage. Scaling storage in the cloud is often as simple again as pushing a button and adding the amount of storage needed. Storage for disaster recovery can grow exponentially. In addition, today’s public cloud storage can also scale down, which is not a capability of traditional on-premises storage devices. Scaling the needs of DR plans with only on-premises storage only can certainly be difficult. Public cloud storage, however, can allow easily provisioning storage quickly when needed to scale disaster recovery storage. Public cloud storage provides the flexibility to have access to storage anywhere in the world, any size of storage, any type of storage, storage that grows, storage that shrinks, scales automatically, and many other characteristics. Again, there is simply no question of comparing having to provision and configure storage on-premises with the ease and convenience of the public cloud. This type of flexibility allows enterprise customers to have storage in the forms, sizes, and locations needed to tremendously bolster their disaster recovery plans. Having agility in the data center allows reacting to needs quickly and with the right solutions. Solutions do not need to be hindered by the technology but rather facilitated by the technology and tools at hand. Public cloud storage provides this type of agility to organizations. When looking at the above advantages of public cloud storage such as data diversity, scalability, and flexibility, this leads to agility in being able to react to the needs of the business. The time it takes to go from sourcing and purchasing to having storage configured and ready to be consumed can literally be weeks if not months. Business operations can be hindered by these long lead times in provisioning infrastructure needed. Public cloud removes these barriers to businesses by allowing infrastructure such as storage to be instantly provisioned and ready to consume, which in turn, leads to tremendous business agility. Disaster recovery is a crucial component of any business continuity plan. It certainly is not a business process that needs to be hindered by traditional mechanisms to provision required infrastructure. Cloud storage is a key aspect of today’s disaster recovery plans that allows tremendous agility in provisioning the required storage. Vembu provides powerful solutions to help businesses today leverage the public cloud for their disaster recovery solutions. Customers can choose between a number of options here with Vembu. 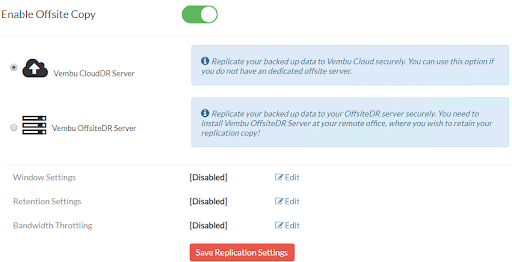 This includes Vembu’s CloudDR solution that allows replicating on-premises backups to Vembu’s cloud storage solution so that backups are stored safely in an offsite “cloud” location. Customers can choose to house their own OffsiteDR server in the public cloud as well. In addition to offering the offsite copy functionality, Vembu also offers solutions to protect the organizations Software-as-a-Service environments such as Office 365 and G Suite. This allows businesses to protect your saas applications from all possibilities of data threat by backing up emails, calendars, contacts, and drives efficiently with backup and restore operations. Public cloud storage is a powerful resource that can be used in many ways. Public cloud storage is well-suited for augmenting disaster recovery plans by providing diverse, scalable, flexible, and agile storage that can be used for long-term or archival storage, or as ancillary storage for storing business-critical backups when scaling storage in hybrid environments. By using public cloud storage as a key component of an effective 3-2-1 backup best practice methodology, organizations can be confident in the redundancy of their data and the ability to provision it as needed without any obstacles or time constraints. Vembu offers robust solutions such as Vembu OffsiteDR, CloudDR, and Office 365/G Suite backups to help organizations not only leverage public cloud as part of their DR plan but also migrate business-critical data to the cloud with confidence, ensuring their data is protected.